According to the biblical Book of Ruth, Ruth was a Moabite woman who married into an Israelite family and eventually converted to Judaism. She is the great-grandmother of King David and hence an ancestor of the Messiah. Ruth's story begins when an Israelite woman, named Naomi, and her husband, Elimelech, leave their hometown of Bethlehem. Israel is suffering from famine and they decide to relocate to the nearby nation of Moab. Eventually, Naomi's husband dies and Naomi's sons marry Moabite women named Orpah and Ruth. After ten years of marriage, both of Naomi's sons die of unknown causes and she decides that it is time to return to her homeland of Israel. The famine has subsided and she no longer has immediate family in Moab. Naomi tells her daughters-in-law about her plans and both of them say they want to go with her. But they are young women with every chance of remarrying, so Naomi advises them to stay in their homeland, remarry, and begin new lives. Orpah eventually agrees, but Ruth insists upon staying with Naomi. "Don't urge me to leave you or to turn back from you," Ruth tells Naomi. "Where you go I will go, and where you stay I will stay. Your people will be my people and your God my God." (Ruth 1:16). Ruth's statement not only proclaims her loyalty to Naomi but her desire to join Naomi's people—the Jewish people. "In the thousands of years since Ruth spoke these words," writes Rabbi Joseph Telushkin, "no one has better defined the combination of peoplehood and religion that characterizes Judaism: 'Your people shall be my people' ('I wish to join the Jewish nation'), 'Your God shall be my God' ('I wish to accept the Jewish religion'). Shortly after Ruth converts to Judaism, she and Naomi arrive in Israel while the barley harvest is underway. They are so poor that Ruth must gather food that has fallen on the ground while harvesters are gathering the crops. In doing so, Ruth is taking advantage of a Jewish law derived from Leviticus 19:9-10. The law prohibits farmers from gathering crops "all the way to the edges of the field" and from picking up food that has fallen to the ground. Both of these practices make it possible for the poor to feed their families by gathering what is left behind in a farmer's field. As luck would have it, the field Ruth is working in belongs to a man named Boaz, who is a relative of Naomi's deceased husband. When Boaz learns that a woman is gathering food in his fields, he tells his workers: "Let her gather among the sheaves and don't reprimand her. Even pull out some stalks for her from the bundles and leave them for her to pick up, and don't rebuke her" (Ruth 2:14). Boaz then gives Ruth a gift of roasted grain and tells her she should feel safe working in his fields. When Ruth tells Naomi what has happened, Naomi tells her about their connection with Boaz. Naomi then advises her daughter-in-law to dress herself up and sleep at Boaz's feet while he and his workers are camping out in the fields for the harvest. Naomi hopes that by doing this Boaz will marry Ruth and they will have a home in Israel. Ruth follows Naomi's advice and when Boaz discovers her at his feet in the middle of the night he asks who she is. Ruth replies: "I am your servant Ruth. Spread the corner of your garment over me, since you are a guardian-redeemer of our family" (Ruth 3:9). By calling him a "redeemer" Ruth is referencing an ancient custom, where a brother would marry the wife of his deceased brother if he died without children. The first child born of that union would then be considered the child of the deceased brother and would inherit all of his properties. Because Boaz is not the brother of Ruth's dead husband the custom technically does not apply to him. Nevertheless says that, while he is interested in marrying her, there is another relative more closely related to Elimelech who has a stronger claim. The following day Boaz speaks with this relative with ten elders as witnesses. Boaz tells him that Elimelech and his sons have land in Moab that must be redeemed, but that in order to claim it the relative must marry Ruth. The relative is interested in the land, but does not want to marry Ruth since doing so would mean his own estate would be divided amongst any children he had with Ruth. He asks Boaz to act as the redeemer, which Boaz is more than happy to do. He marries Ruth and she soon gives birth to a son named Obed, who becomes the grandfather of King David. Because the Messiah is prophesied to come from the House of David, both the greatest king in Israel's history and the future Messiah will both be descendants of Ruth—a Moabite woman who converted to Judaism. Ruth's story takes place during the Spring harvest, which is when Shavuot falls. 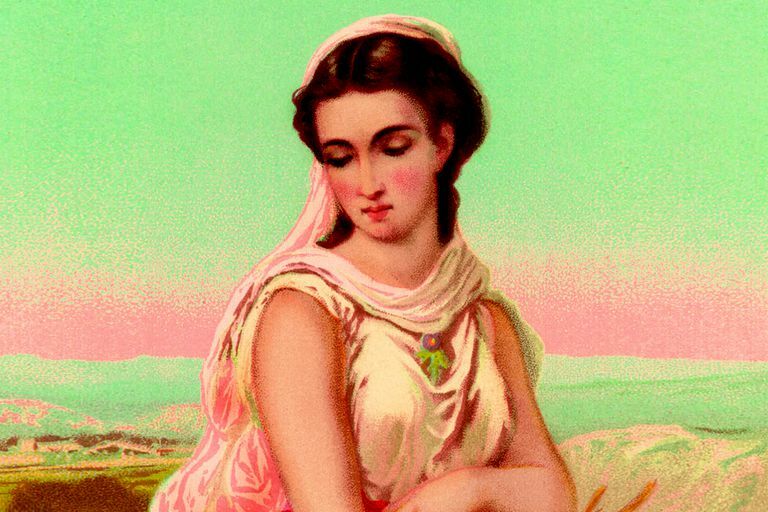 Ruth is an ancestor of King David, who according to tradition was born and died on Shavuot. Since Ruth demonstrated her loyalty to Judaism by converting, it is appropriate to remember her on a holiday that commemorates the giving of the Torah to the Jewish people. Just as Ruth freely committed herself to Judaism, so too did the Jewish people freely commit themselves to following the Torah. Kolatach, Rabbi Alfred J. "The Jewish Book of Why." Telushkin, Rabbi Joseph. "Biblical Literacy."